Ah, June. 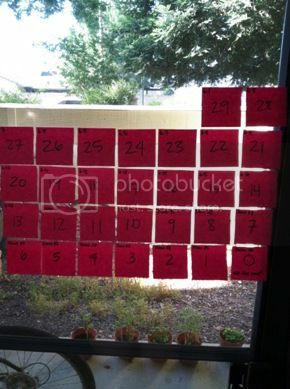 This is going to be a crazy month for me - my Post-It note countdown calendar is down to one color! Getting ready to move has been hectic, mostly in terms of mental preparation. Trying to figure out how to get back efficiently has been very emotionally challenging. I have boxed up all my books, movies, picture frames, and knick-knacks, with a small pile left to be packed up (as soon as more boxes come in the mail). I'm waiting on the mailman right now to pick up the first five boxes, to be shipped to Matt's apartment in Chicago. As long as they arrive safely and it isn't too frustrating a process, I'll continue to ship the other boxes. If not, I have to reassess. It's tough, because the most stressful part lately has been the idea of shipping all my kitchen stuff, my bedding, and my computer. Most of my stuff fits in the USPS large flat-rate boxes, I just have a lot of them. This other stuff, though, will need bigger boxes. And it makes me anxious. We talked briefly about him flying out here and driving back (cheaper than flying out my mom and brother for the same trek), but there's a lot that complicates that and makes it pretty unlikely. Work-wise, things are good. Week 2 of my summer course ended yesterday, hard to believe it's already one-third over! I have exams to grade this weekend - luckily, there are only six students, and they're all great, so it won't take long. The kids are really motivated, as tends to be the case with intensive summer courses - they know it's an accelerated pace, so you tend to not have any of the slacking that happens during the semester. As much as it would have been good to have the class canceled and be able to move back earlier, I'm grateful for the chance to earn one last great paycheck before diving back into being mostly unemployed. Not having a job offer yet is stressful, but I'm trying to stay optimistic. I have a part-time job lined up, plus a good amount of money saved up, plus two roommates to share rent/bills with, so as long as I am mindful of my spending, I shouldn't have to worry if things don't work out right away. With teaching, at least as far as adjunct faculty positions go, hiring can happen very soon before the semester starts, as it is contingent on course enrollment. I'm confident that things will work out, even if I am not entirely certain just yet about what that will mean. No matter what happens, I'm still feeling entirely confident that turning down my offer from the University of California was the right decision. Karen posted about a similar quandary on her blog this week; she said it best, "they say beggars can't be choosers, but sometimes they're wrong." As far as workouts, this was a good month. I'm down to 191, down 5 pounds from May 1 (but still up 2 pounds from my lowest weigh-in in early April). I ran 25.5 miles, biked 200.29 miles, and did 269 minutes on the elliptical. I don't log it, but I also did a ton of walking this month - between trips to the grocery store, walking to/from the gym, and of course, Bay to Breakers! So far in 2012, I have ran 153.07 miles and biked 956.95 miles. 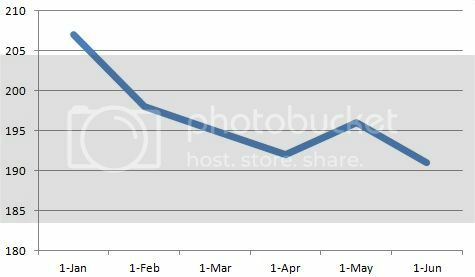 That's 55.17% of my year goal - not too shabby! For June, I'm looking forward to getting back into longer runs for marathon training (my longest since the January half was a 10K in February), and getting in as much time on the bike as I can before I have to sell it (there's no easy way to ship it to Chicago, plus I have nowhere to store it there, and also, I'm terrified of city biking). I'm a little upset that there seems to not be any races near me in June - I wanted to do a race a month this year, and have succeeded thus far. I'll have to keep my eyes peeled. 2. Keep up with marathon training. 3. Arrive in Chicago weighing less than when I moved last summer (192). 4. Complete three 101-in-1001 goals. I've gotten very distracted from my 101-in-1001 list, and want to get back to working on that since I only have about 14 more months to complete it! Also, I'm oddly obsessed with round numbers; my 100 week anniversary of healthy living coincides with the day when there are exactly 100 days remaining before the Chicago Marathon. I'm putting together thoughts and ideas on a blog challenge, so look for more information on that hopefully soon! What about you? How was your May? What are you looking forward to most in June?